Overfishing and changing sea temperatures are pushing seabirds to the brink of extinction, according to new data on the world's birds. Birds that are now globally threatened include the kittiwake and the Atlantic puffin, which breed on UK sea cliffs. Meanwhile, on land, the Snowy Owl is struggling to find prey as ice melts in the North American Arctic, say conservation groups. The iconic bird is listed as vulnerable to extinction for the first time. "Birds are well-studied and great indicators of the health of the wider environment,'' said Dr Ian Burfield, global science coordinator at BirdLife International, the IUCN Red List authority on birds. He added that success in kiwi and pelican conservation had shown that, when well-resourced and supported, conservation efforts do pay off. Worldwide, over a quarter of more than 200 bird species reassessed by the International Union for the Conservation of Nature have been moved to higher threat categories while a similar number have been downgraded. Seabirds are of particular concern, including Cape gannets, which are now classified as Endangered, and the Antipodean Albatross, which risks being drowned by fishing lines. Fishing pressures and ocean changes caused by climate change are reducing food supply for the chicks of seabirds, while adults receive little protection when they fly over areas of the ''high seas'' that do not fall under the jurisdiction of any country, says BirdLife International. The kittiwake (Rissa Tridactyla, or black-legged kittiwake), which breeds along northern coasts, has declined globally by about 40% since the 1970s. 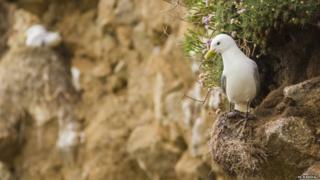 More than 70% of the British breeding kittiwake population is found in Scotland. However, there has been a dramatic decline, particularly in Orkney and Shetland and on St Kilda in the Western Isles. "Some efforts are underway to protect important seabird foraging areas in international waters, but there is much more we could do around the UK to protect our internationally important and increasingly threatened seabird populations," said Laura Bambini, the RSPB Scotland's seabird recovery officer. Sandeels are a vital food source for breeding seabirds in the North Sea. The eels are threatened by rising sea temperatures and are also harvested by commercial fisheries. "We need to ensure that the future management of the sandeel fishery is sustainable,'' said Dr Euan Dunn, the RSPB's marine policy specialist. Elsewhere, the Snowy Owl has moved up the rankings from Least Concern to Vulnerable. The North American population has declined by 64% since 1970, as changing temperatures affect its habitat and prey. Collisions with vehicles and utility lines are also a threat to the owl, made famous in the Harry Potter books. "Arctic biodiversity is under pressure from a number of stressors, including climate change, so hopefully the uplisting of the Snowy Owl as a flagship species will also draw attention to wider issues in this region,'' said Dr Burfield. In Asia, the Yellow-breasted Bunting (Emberiza aureola), which is illegally trapped for food, has been uplisted from Endangered to Critically Endangered. More positive news comes from Europe, where Dalmatian Pelicans are recovering after conservation efforts. This year, pelicans on Lake Skadar in Montenegro had their most successful breeding season ever, raising 60 chicks. However, while two species of kiwi in New Zealand are now less threatened, the Kea is declining, in part due to tourists feeding the parrots with junk food like bread and chips.